Which is right? That is a question I will try to answer based on my own data. For organic and medicinal chemists flash chromatography is an integral part of your synthesis workflow – after all, you do need to isolate your product after synthesis. For most of these chemists, automated flash chromatography with pre-packed cartridges has improved reaction mixture purification efficacy. These flash systems usually have preset operational parameters to simplify the chromatography – select a cartridge, solvents, elution/detection method, and press the run button. Depending on the column size and flow rate, most runs are finished in under 20 minutes so speed is, by and large, addressed. However, when it comes to recovered compound yield and purity the important parameters include selectivity (there needs to be a separation between the target product and the impurities/by-products) and separation efficiency (also known as plate count). Plate count/efficiency addresses the purity goal (assuming selectivity exists) and selectivity addresses the yield requirement (more separation equals more yield (and purity)). But, how does flash column design (e.g. column length/column diameter ratio or L/D ratio) impact these parameters? As mentioned earlier, many of the chemists I have talked to over my 40-year career believe it does with most believing a column that is longer, but thinner, is better. 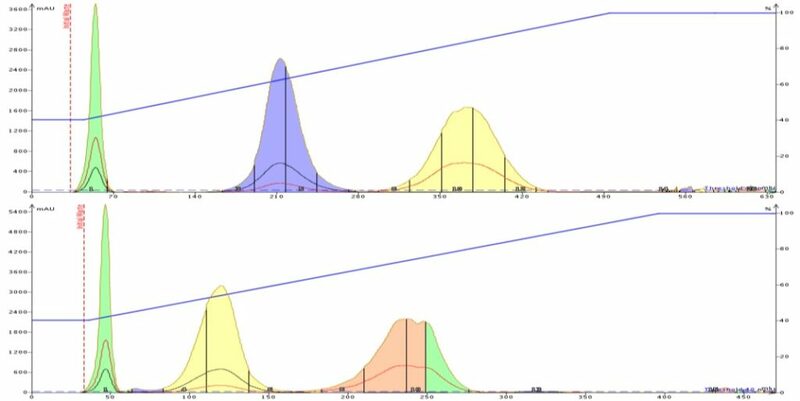 Well, longer columns do provide higher plate counts (more plates per column) meaning that the elution bands are sharper (reduced fraction volume) which is what you want when performing analytical HPLC. Wider columns, however, provide increased loading capacity and this is what preparative chromatography needs. In fact, for every doubling of column diameter loading capacity increases 4x – an important parameter when performing preparative (flash and HPLC) chromatography. In flash chromatography, sample loading capacity impacts both yield and purity. There are trade-offs here – higher loads improve yield but can diminish purity while lower loads improve purity but reduce yield. That relationship is straightforward and something I previously discussed. In my experience, it usually does not matter to a great degree whether a flash column is long and thin or short and fat if they contain the same amount of the same media. In reality, upon sample loading, whether liquid or dry, the sample will spread to the column walls and elute in a band. With long/thin columns, the band is thicker and, depending on load amount, can degrade the column’s plate count. With a wide/short column, there are fewer plates per column but the sample is spread over a much larger surface area so the elution bands are thinner they migrate down the column. Unless there are some serious column/media differences, the results usually are similar. 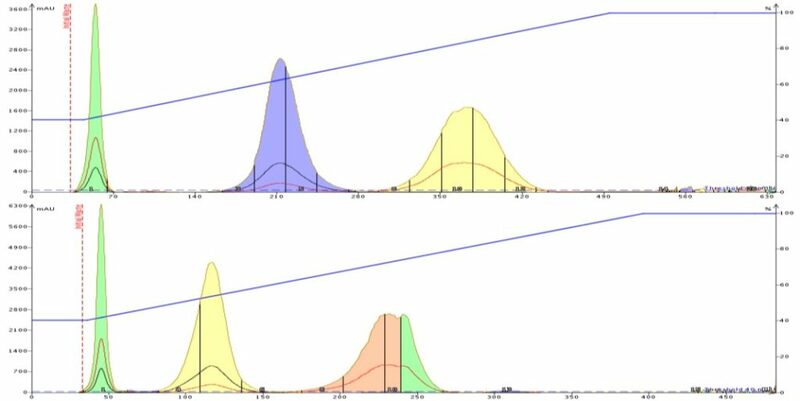 To determine if L/D ratio has an impact on flash purification, I compared a 25 gram Biotage® SNAP Ultra cartridge (~25 µm) with a L/D ratio of ~2.40 (short/fat) to an Isco Redisep® Gold 24 gram cartridge (~30 µm) with a L/D ratio of ~ 4.74 (long/thin). Three runs were performed with the first using a flow rate of 75 mL/min with the SNAP Ultra 25 gram column (this is its default flow rate). The second run used an Isco RediSep® Gold 24 gram column also at 75 mL/min to match flow rates. The third run also used an Isco RediSep® Gold 24 gram column but was operated using the Isco recommended flow rate of 35 mL/min. The reason I chose to use two different flow rates with the Isco cartridges is that linear velocity has a large impact on separation performance as well. At the lower Isco column flow rate the solvent linear velocity for the Biotage and Isco cartridges are similar and provide optimal results, Table 1. Figure 1 shows a 3-component separation performed on a Biotage® SNAP Ultra 25 gram cartridge and an Isco RediSep® Gold 24 gram cartridge at equivalent load and flow rate (75 mL/min). This run shows that both cartridges perform the separation but the Isco cartridge elutes non-symmetrical (fronting) compound peaks with less retention and what appears to be increased fraction volume compared to the Biotage cartridge. The splitting of the last peak is due to the polar injection solvent (IPA). Part of the retention difference is the fact that Isco and Biotage use different silica though both are ~25-30 µm in particle diameter. Figure 1. SNAP Ultra 25 gram (top) and Isco RediSep® Gold 24 gram columns run at 75 mL/min show faster elution with the Isco cartridge but with broader, misshaped peaks. The SNAP Ultra cartridge has an L/D ration of ~2.40 whereas the Isco Gold has an L/D almost 2x larger at ~4.74. The faster solvent linear velocity through the Isco cartridge increases the fraction volume and partially causes fronting. When operated at the slower flow rate (35 mL/min), the Isco RediSep® Gold cartridge elutes peaks that are slightly sharper but still front; fraction volumes are reduced slightly as well, Figure 2. However, the overall separation performance did not change. Figure 2. At similar linear velocity, the shorter/fatter column (top) still shows an improved separation vs. the longer/thinner column. Calculating resolution by dividing the difference in adjacent peak retention volumes (at their apex) by the sum of the adjacent peaks’ fraction volumes, Equation 1. From this data we see a shorter/fatter column (Biotage® SNAP Ultra) provides more resolution (especially peaks 1 and 2) and elutes the compounds in smaller volumes compared to the longer/thinner Isco RediSep® Gold. The resolution and retention differences are caused by the silica used by Isco and Biotage. Isco silica and Biotage silica do not have the same surface chemistry or surface area though they do share a similar particle size (~ 25-30 µm). The difference in L/D ratio, however, does impact the amount of bandspreading which is seen with the fraction volume/retention volume ratio. For this sample, a shorter/fatter column does appear to provide better purification results. What has your experience been with long/thin vs. short/fat flash columns? For more information on flash method development and optimization, click on this link and register. Also, please take our survey regarding this blog; I’d love to see your thoughts. ¹Neue, Uwe; Theory of Chromatography. HPLC Columns – Theory, Technology, and Practice; Wiley-VCH: New York, 1997; p 9. I have mixed thoughts on this. On the one hand when I first started using semi-prep hplc columns I was taught to scale up according to diameter and to keep the length the same. Suppliers sold “guaranteed linear scale” up kits with 4.6, 21.2 and 30mm dia columns, which when used at the same linear velocity, same relative injection volume and mass, produce the same result. The prep columns would then be overloaded leading to distorted peaks but enabled higher throughput. When automated flash purification arrived, the available columns differed not only in diameter but also in length. I used to worry a lot about this. I knew that from an analytical point of view, doubling the length meant doubling the plate count but resolution suffers from the law of diminishing returns and would only increase in proportion to the square root of plate count. So it seemed like inefficient use of silica. I was hankering after the old days where I had a columns of one reasonable length and varying diameters. Of course the manufacturers would have had to provide a pump which could deliver low and enormous flow rates so I guess this is why they chose to make the heavier columns relatively long and thin, compared to the lighter columns. I used to worry that if I had had successfully purified 500mg with a relatively short 25g column then scaled up to 30g on a relatively long 1.5Kg column, that I wouldn’t get the same resolution. I’ve stopped worrying. It’s not the equilibrium process you read about in hplc text books, it’s massively overloaded low performance and the equilibrium is totally overwhelmed by the mass of material compared to the mass of silica. I like to think this makes prep more of an art than a science! The bottom line is that I scale up according to the mass of silica and forget about proportions. Also given the choice I would also go for short and fat. As long as the short column has enough plates then thats enough and the run will be shorter. I love the dissertation! You hit the nail on the head with your point of scaling by the amount of media – that is the way I have done it and lectured about for years. It is simple and it works. The only variable that then needs to be calculated is linear velocity. If the small and large columns have similar linear velocities then the purification will scale. I always opt for shorter/fatter columns for a simple reason that with long columns you risk band broadening due to the diffusion and consequently fraction overlap. Thank you for your comments. Bandbroadening can be an issue with longer columns though using gradient elution helps to minimize it. In prep, especially flash, time is important, and if a successful purification is achievable in less time with the same, or better results, why not go with short/fat columns. 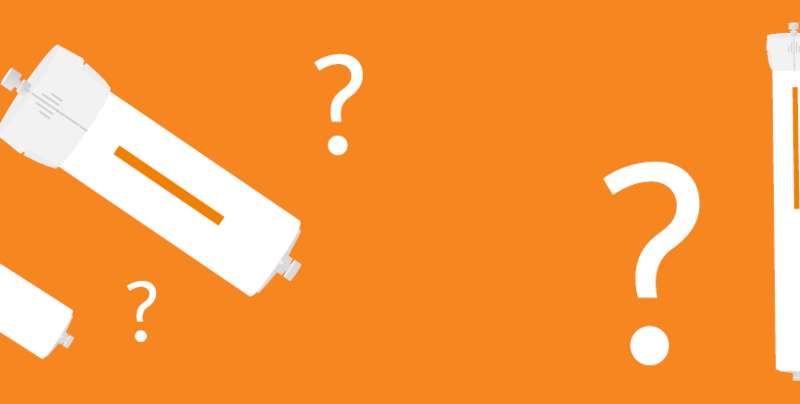 Previous Previous post: When should I use dry loading instead of liquid loading with flash column chromatography? Next Next post: What do I do if a 2-solvent gradient will not separate my sample?